576 pages | 13 B/W Illus. Bob Reinalda has directed an unequalled general survey on international organizations. The multiple inputs of this book open exciting research opportunities and offer food for thought to all the students, researchers and practitioners who consider international organizations as a major phenomenon in contemporary international relations. Guillaume Devin, Professor of Political Science, Sciences Po Paris, France. A very international set of authors provide overviews of and insights into many major lines of IO research in essays that will be useful for students and scholars alike. Among the pathbreaking essays are "IOs and the Idea of Equality," "IOs and Crisis Management," and "Learning in IOs." Margaret P. Karns, Professor Emerita of Political Science, University of Dayton, USA. 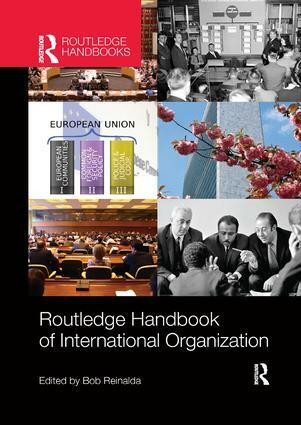 Reinalda's Handbook of International Organization gives an excellent overview of the field. Its international authors show how interdisciplinary and vibrant the field has become in recent years. This Handbook will become an indispensable work of reference. Dennis Dijkzeul, Professor of Conflict and Organization Research, The Institute of International Law of Peace and Armed Conflict, Ruhr-University Bochum, Germany. Bob Reinalda is Senior Researcher at Radboud University Nijmegen, Nijmegen, The Netherlands. He has published about autonomous policy making by, decision making within, and implementation by international organizations (together with Bertjan Verbeek and Jutta Joachim). He wrote the Routledge History of International Organizations (2009) and is co-editor of IO BIO, The Biographical Dictionary of Secretaries-General of International Organizations.